Crossing Boundaries is a year-long professional development experience that entails access to the Crossing Boundaries curriculum, sustained teacher professional development, and a variety of opportunities for students to see scientific and environmental careers in action. Secondary teachers and students will analyze biodiversity conservation issues in their local or regional environment as well as in the Brazilian Amazon and Chiapas, Mexico. Teachers of all types of secondary science courses are welcome to apply for the Crossing Boundaries Institute. Teachers will learn about geographic information technologies, such as GIS, GPS, Google Earth, Google Maps and communication technologies, such as blogs, wikis and podcasts. These tools create powerful opportunities for teaching, learning and assessment. The Crossing Boundaries staff is developing a number of curricular units that will enable secondary students to explore and analyze biodiversity conservations issues across the globe. For example, Crossing Boundaries students will use a variety of high-quality web resources to investigate biodiversity conservation issues on a worldwide and local basis. 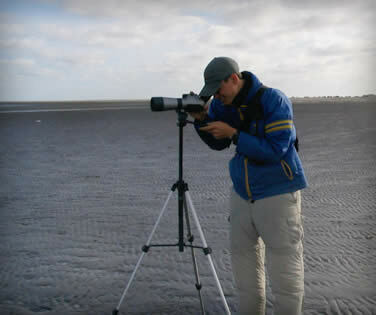 Nate Senner studies the migratory patterns and survivorship of Hudsonian Godwits. To do this, he travels to the tip of South America and north to Alaska and the Canadian Arctic.